The first time you experience panic disorder symptoms, you should see a doctor for a full check-up to rule out physical illnesses. Assuming that you have a clean bill of health and the diagnosis is panic disorder, there are a number of treatments available. Common panic disorder treatments for prescribed by doctors include medications and cognitive-behavioural therapy (to change faulty beliefs and avoidant behaviours). Frequently prescribed medications for anxiety disorders include antidepressants and tranquillizers. Tranquillizers can cause problems because they have a sedating effect and can trigger rebound anxiety when people quit them. Also, those who use them regularly develop a tolerance over time, which means that they need to take more to achieve the same effect. Tranquillizers should only be used in extreme cases and preferably not continuously. They can be an effective stop-gap measure to take the edge off while working on a more permanent solution to the anxiety problem, but they should not be viewed as a regular or permanent solution. Antidepressants are safer, though they take a few weeks to start working. However, studies indicate that after six months, antidepressant therapy no longer decreases relapse rates (Ham et al., 2005). Cognitive-behavioural therapy provides a long-lasting solution to panic with reduced risk of relapse because it targets the root causes of panic rather than simply addressing the body’s response to it. See Cognitive-Behavioural Therapy for Anxiety for more information on this highly effective treatment. 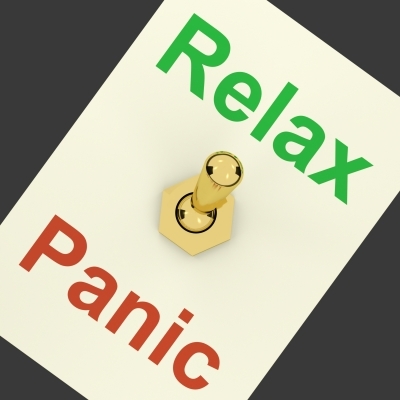 Nearly every panic sufferer experiences a reduction in panic disorder symptoms (and in some cases, a complete cure) with appropriate treatment and lifestyle changes (Dr. Kim Maertz, 2008). See Quick Help for Panic Attacks for things you can do during an attack to end it faster or at least reduce the intensity and get through it. For more information on anxiety and panic, see the main Anxiety and Panic Disorder page. This article is provided for informational purposes only and is not intended as a substitute for medical consultation. Health concerns should be referred to a qualified doctor.